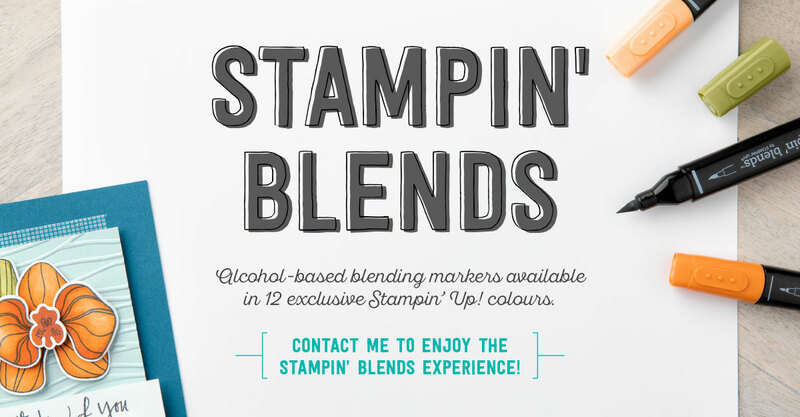 As you may have seen across the internet, Stampin' Blends alcohol marker pens have been launched this week. I am loving using my pens - I am certainly NO EXPERT when it comes to colouring in, but these artist-quality colouring markers are so easy to use and you will get a great result, with little or no experience! At just £4 per pen, they are priced well, especially as you can buy them individually, in packs of 2, or the complete set! As well as colouring images, you can also use them to colour our pearls and rhinestones to match your project. Easy blending and colouring - use the brush tip for large areas and the bullet fine tip for smaller, detailed areas. I know that many of you like to collect the whole set, so I have arranged a Blends club that allows you to do just that! Join my club and you will get a FREE Memento inkpad (recommended use for stamped images). See this document for full details, and join the club today. Gift options also available - what a perfect present for someone you love? Click on the photo below for the full product range or to order. I can't wait to share more samples of these with you.